Image caption Police officers and firefighters from Staffordshire were helped by a specialist underwater search team from Nottinghamshire Police. A man's body has been recovered from a canal in Stoke-on-Trent after he fell overboard from his narrowboat. Michael Holgate, 58, from Windermere in Cumbria, fell while travelling through the Harecastle Tunnel near Kidsgrove at about 13.15 BST on Tuesday. Staffordshire Police said his death was not being treated as suspicious and it was a "tragic accident." 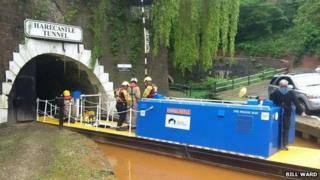 The 1.5-mile tunnel, which was closed to enable searches to take place overnight, has now reopened. A police spokesman said the coroner had been informed and officers had been supporting Mr Holgate's wife, who lived with him on the narrowboat. Police officers and firefighters from Staffordshire were helped by a specialist underwater search team from Nottinghamshire Police. Insp Andrew Shackleton said: "It was a very difficult environment to work in. It was cramped and very dark inside the tunnel and radio communication was limited. "This was an unfortunate, tragic accident."